We sat down with Flavia Pennetta and Roberta Vinci the two Italian tennis stars who made history with their US OPEN final match—not only an unforgettable victory for tennis but for the values associated with sport. “Canadian doubles.”Three women sit down for an interview. 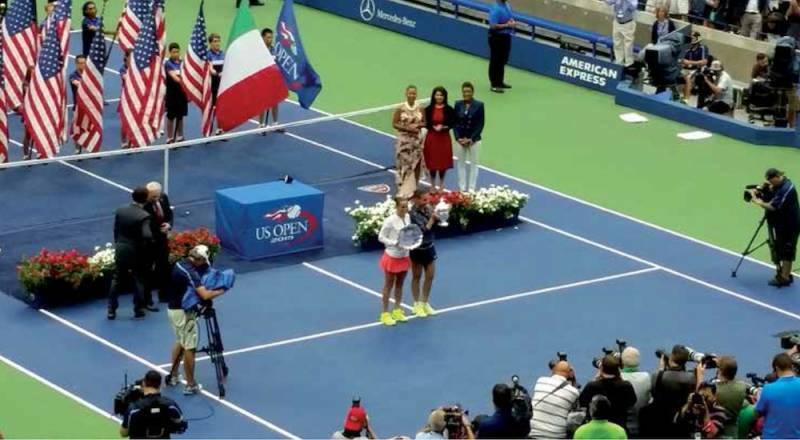 Two of the women made history for Italian sports last September at the US OPEN. As the year comes to a close, we wanted to celebrate sports, especially women in sports. Women, in our opinion, make all the difference. Flavia Pennetta and Roberta Vinci’s style of competing was truly a sight to see. can be friends. Remember their prolonged embrace at the end of the match at Arthur Ashe Stadium? That was spontaneous. No one was posing for the cameras. Indeed, they appeared to be two friends hugging it out. Look at the photos again. Can you tell which won and which lost? It may have been a “tricolor derby”—“a historic day,” as Italian Prime Minister Matteo Renzi, who flew down to watch the game, put it— but most of all it was a celebration of female sportsmanship. That the tournament was shaping up to be an unprecedented match between two Italians only dawned on champion Flavia Pennetta gradually. “It’s happened at other WTA tournaments; I’d see fellow Italians moving up in the draw alongside me, and I’d played against Roberta several times when I was younger. For Roberta, the first thrilling moment came before the final. Her victory over Serena Williams, another unforgettable moment, stunned everyone. Beating the great American player appeared impossible. But Roberta managed to give us—Italians, certainly—a moment to remember. But back to Flavia. As soon as victory was hers, all the toil and tension vanished from her radiant face. She was pure happiness. But what was going through her mind as she played? How did she feeling during the match? And how do you feel about it now that a few months have passed, we ask, avoiding the subject of her shocking announcement to retire from tennis (superstitiously, perhaps, holding out a sliver of hope...). “For the first few days what I had done didn’t really register, then slowly, as the adrenaline wore off, a positive feeling came over me. I became aware of having brought to completion a lifelong goal, and giving a sense of satisfaction to everyone who has helped me along the way, including my family!” Boyfriend and colleague Fabio Fognini was in attendance that day, and a lot of cameras zoomed in on him none too discreetly. So, we ask with a smile, who’s going to teach their kids tennis? Do women sacrifice more than men? Is it still difficult for a woman to reach Flavia and Roberta’s level in a country like Italy? And if so, why? Flaviaisalittlemoreoptimistic.“There have been a lot of breakthroughs in women’s sports in the last few years,” she says. “It’s no longer so easy to say that gaining access to particular levels is difficult. Unlike a lot of other normal social environments, regulating agencies, organizers and international sports institutions have worked together to create more balance between the two categories (men’s and women’s).” Roberta’s experience, however, felt more fraught. “Practicing competitive sports is very hard if you don’t have the complete support of your family. Flavia and Roberta have played together since they were 9 years old. What is it like to play against an old friend in a final this important? How do you balance competition and friendship? “Friendship is the basis of all human relationships,” says Roberta, “and that includes those who play sports. It’s clear that their “mission impossible” has led many young people to regard them as role models. How aware of that are they? “I hope I am,” says Flavia. “I would like to dedicate more time to young people and the less fortunate. I must admit that I never had much time to explore such issues and I consider myself a very fortunate person. And New York? What is your relationship to the city and the people who crowned you? It turns out New York is one of Flavia’s favorite cities. “I always feel at home here. New York has always had an influence on my performance in the tournament. I’d be remiss not to thank the city and its people.